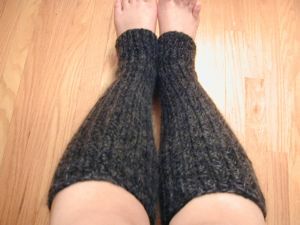 First, the good stuff – I finished that neverending pair of legwarmers! 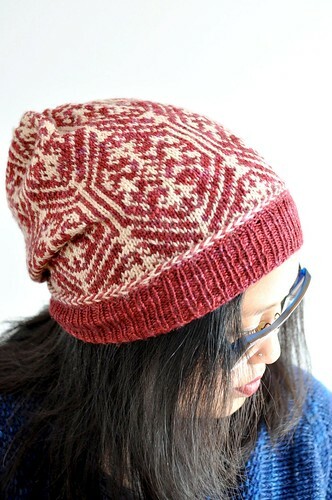 A skein and a bit of Paton’s Classic Merino, and one strand of Rowan Kidsilk Haze, held together on US 7 needles. I ended up a few inches short on the second legwarmer, not wanting to break into a new skein of the kidsilk, but I just ripped back the first one so they matched. They’re looooong. Also, since they’re so stretchy, they work as armwarmers too – at least now, before they’ve been all stretched out by my legs. The not so good stuff….I hate the needles I’m using for my Esprit socks, that Collection bamboo circ I bought (same time I bought the Regia). The problem? The join. 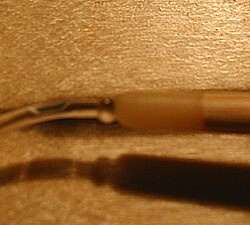 You can kind of see it in this pic (looking at the shadow of the needle shows it, too). There’s this annoying ball of plastic at the end of the cord, then the needle starts. The stitches get stuck right between there! Argh! There’s so much pulling through with the magic loop, and this is SO irritating. I probably won’t be going downtown until Tuesday at least, and the snow is definitely making me not want to go out unnecessarily, so I can’t buy a new needle. I don’t even have 3.5 mm dpn’s that I could switch to, only 3 and 3.75.